Our football club gives our members aged 16+ the chance to enjoy a popular sport and improve their skills. Players don’t need any football skills or knowledge of the game to join football club, just a willingness to get involved and a positive attitude! 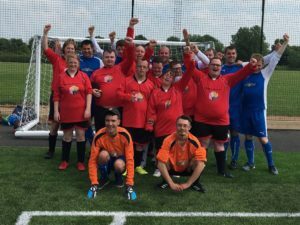 Our football team is entered in the Somerset FA South West Ability Counts league and play regular league matched against other teams from the region. The team are currently top of Division 2! If you are interested in joining the football club, please email laura@keynshammencap.org.uk or contact us .